Membership in the CFA is not required to post a query related to Chandler heritage. If appropriate, your query will also be considered by the CFA Genealogy Panel, a group of volunteers who are willing to help other Chandler researchers. More about the CFA Genealogy Panel. Please include in your query all the information that will help us consider your question, including ancestors’ names; dates and places of birth, death and residence, and the research you have already done. Clicking on the address at left will open a new email to members of the Genealogy Panel. If you do not have an email program installed on your computer (perhaps you use one of the online email services like Yahoo or Gmail), you will need to type the two addresses into your message. In that case, please include “from CFA Queries page” as the subject. All e-mail address links on this web site are encoded for security. The addresses appear to be text but are actually a graphic image. Personal pages linked from these queries are not under the control of the CFA, which makes no claims as to their accuracy. Look for this graphic – – to indicate web page links. Marge Rice of Illinois has a hobby of rescuing old photos from flea markets and antique shops. She has been able to reunite nearly two thousand images with family to date. Her website is facesfromthepast.net.Marge has three Chandler photographs in her inventory and would love to reunite them with their families. She asks only to be reimbursed for her costs, which for these three photographs range from $9-$12, including postage. Elliott or Elliot Talcott Chandler – an original cabinet card photo* taken in Mendota, LaSalle County, Illinois. Elliott was born 20 January 1892 in Lee Co., Illinois, son of Augustus Wellington Chandler, a physician, and his wife Julia H. Talcott. In the photograph, Elliot is a smiling boy of about 3 years, wearing a muff and a fur type collar and hat, all over a very obviously fancy warm floor length coat. The photo was taken by the Keller Studio in Mendota, Illinois.Elliott and his wife Roberta lived in Rockford, Winnebago County, and he died in 1985 in Rockford. Roberta is shown as a year younger than he in the 1930 census. They had daughters Carol L., age 7, and Marjorie, age 4 months in 1930; therefore, it is quite possible there are lineal descendants. Note: CFA records show Elliot as a descendant of William Chandler, born Hertfordshire, England, in 1595. That family is designated Genetic Chandler Family #9 by the Chandler DNA Project. Floyd Chandler – cabinet card photo* of him at about age 1 in a christening gown. Photo was taken in Sabula, Jackson County, Iowa, in about 1895. I checked the 1900 census for Jackson County for all Chandlers and cannot locate Floyd. Since Jackson County is in extreme northeast Iowa, near the Mississippi River, it is possible Floyd was actually from Illinois, but nothing connects the name and time frame and location. Note: The CFA was not able to add anything to Marge’s research on Floyd Chandler. Herschel Chandler – cabinet card photo* taken about 1890-1895 in Emporia, Lyon County, Kansas. He looks to be about age 30. I’ve searched for Herschel in census records for about six years now, since purchasing the photo from a Chicago antique shop in 2008. There are Herschel Chandler men, but few who fit the age range in about 1890 and none of them seem to be connected with Lyon County, Kansas. There is one remote possibility fitting the age range, per an Ancestry PMT posting – a Benjamin Herschel Chandler Sr. born in Rappahannock County, Virginia, who died in 1938 in Seattle, Washington – but I have nothing else. Note: The CFA was not able to add anything to Marge’s research on Herschel Chandler. Elizabeth (Betsey) Chandler, born circa 1792 in Green County, Kentucky, is the daughter of the Reverend John Chandler, born 25 November 1755 in Halifax(? ), Virginia. John” s children include Sarah (Sally), b. 16 Nov 1776; Horatio, b. 20 Oct 1778; Dorcas (Darkey), b. circa 1780, Virginia; Scott, b. 1782; Catherine, b. circa 1784, Virginia; Frances, b. 1786, Taylor, Kentucky; Elizabeth; and Lucinda, b. 23 Sep 1788, Green County, Kentucky. There are claims that John married Cathy (Catherine) Tunstall, or Elizabeth Shreve. Both of these have been disproven, even though there is some good documentation supporting them. There is also a claim that John married Elizabeth Terrell, but I have no source evidence. Elizabeth”s father died 9 Dec 1843 in Taylor County, KY.Elizabeth Jane Chandler (b. 1820, KY; d. 1870) m. George W White (1818, VA; d. aft 1870). I” m loosely related to this couple, and I”d love to know who Elizabeth” s parents are. There are not that many Chandlers in Kentucky, particularly the Adair County area where this couple lived for a time (probably died there), but I can”t identify who her parents are. 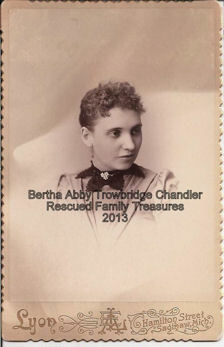 I suspect I am related to her through my Chandler line, as well as through her husband” s line. Any help you can offer Jim would be very much appreciated. 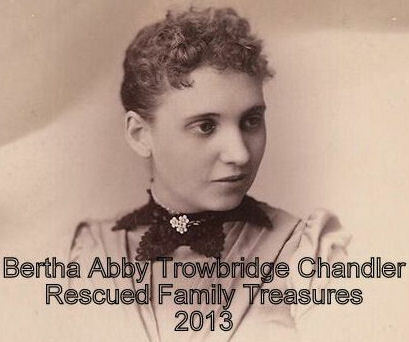 If you would like to claim this portrait of Bertha Abby Trowbridge Chandler for the family, please contact Kathy.